Game of Thrones continues to be a popular source of parental inspiration, according to the latest list of the most popular baby names in England and Wales. 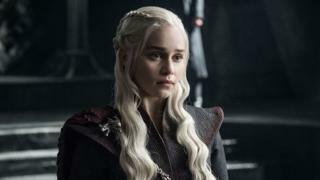 A record 76 baby girls were called Khaleesi in 2017, the title enjoyed by Emilia Clarke’s dragon-raising would-be queen in the award-winning fantasy TV and book series. Three more children were called Daenarys, the real name of the show’s Mother of Dragons. And more girls than ever before received the name Sansa, another significant figure on the show. BWhy are Leigh and Tracey unpopular? Animated movie Moana was released at the end of 2016, explaining why seven babies ended up receiving that particular name in 2017 – seven more than the previous year. The Star Wars universe has also continued to wield its influence on name choices. It’s likely the death of Carrie Fisher in December 2016 was a contributing factor to the big increase (to 149) in girls being called Leia. Indeed, more children than ever before have been given names from a galaxy far, far away. Twenty-one were called Rey and 70 were called Kylo, almost certainly after the characters played by Daisy Ridley and Adam Driver in recent Star Wars instalments. Three girls were given the name – but hopefully not the personality characteristics – of Harley-Quinn in 2017. The DC Comics villain and Joker’s girlfriend was memorably played by Margot Robbie in the film Suicide Squad. In a similar vein, the success of the TV series Lucifer, in which the Devil leaves Hell and travels to Los Angeles, seems to have resulted in 11 boys being given the name of the show. It began in 2016, the year the name Lucifer entered the list for the first time. Four babies were given the name that year, a figure that increased by seven in 2017. Reality TV is also getting in on the act. Before Made in Chelsea, the name Binky had never featured on the list. That all changed in 2014, and the number of Binkys has steadily increased with 10 newborns getting the name last year. In case you were wondering, Binky Felstead’s real name is Alexandra. Choosing the right name for a newborn can be a tricky business. Luckily the world of TV and film is overflowing with unusual suggestions, and it’s somewhere more and more parents are going to for inspiration. What’s the betting we’ll see some baby girls called Toff next year, following Georgia Toffolo’s triumph on 2017’s I’m A Celebrity?